Have you heard of the word “nutracosmetics“? This refers to supplements that are taken orally that produce a cosmetic benefit. At Evolutions Medical Spa, we believe that taking care of your skin starts from within and we recommend nutracosmetics to enhance your home skincare regimen. If you are looking for supplements in Santa Barbara that work wonders, look no further than the SuperFood Solution supplements that come in three different formulas: NanoGreens, NanOmega, and NanoPro. We’ve blogged about the benefits of all three of these in a past post. Add a 1/4 scoop to 1/2 cup of unsweetened applesauce and this becomes a kids favorite! Stir in 1/2 scoop or more to 6 ounces of yogurt and get an extra dose of probiotics. Thoroughly blend some ice with your favorite berries (strawberries, blueberries, blackberries) in water, green tea or fruit juice. Add a scoop of NanOmega for a few seconds and enjoy an antioxidant fruit smoothie. Add a scoop of NanOmega to 8 to 10 ounces of extra pulp orange juice instantly adding extra calcium and vitamin D for strong bones and fiber. Blend ice, whole or low fat milk and 1/4 teaspoon of malted milk (or 2 tablespoons of Ovaltine instead of malt) and a scoop of NanoPro for a fortified chocolate super shake. Lactose intolerant people can enjoy a scoop of NanoPro with enriched soy, rice or almond milk. Mix in small bowl. Cleanse and dry your face. 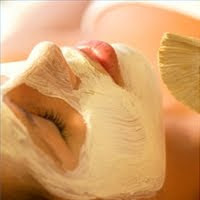 Use a facial brush or your fingers to apply to face, neck and top of hands. Let stand for 20-30 minutes. Shower off or use warm towel to wipe off. SuperFood Solution supplements are available in Santa Barbara at Evolutions Medical Spa. View Evolutions Medical Spa hours and location here. Beautiful Skin from Within! NEW Supplements from Evolutions! At Evolutions we believe that skin care is an ongoing project. Evolutions offers the best-of-the-best in skin care products that have been hand-picked by Evolutions’ founder, cosmetic surgeon Dr. Terry Perkins, for clients to keep their skin healthy and glowing in their home care skin regimen. Evolutions is excited to announce that we have added three new products to our shelves for beautiful skin! These products promote beautiful skin from within! They are supplements from BioPharma Scientific that work to beautify your skin and boost your overall health – NanoGreens, NanOmega and NanoPro SuperFoods! Each of these are supplements are in powder form and can be mixed with 6-8 ounces of cold water, milk or juice or blended in smoothies for a delicious, nutritious drink. NanoGreens – Fruits and Vegetables to the Power of 10 – will provide the body with phyto-nutrition and antioxidant power of more than 10 servings of fruits and vegetables. Phyto-nutrients have been shown to lower the risk of cancer, heart disease, diabetes and stroke, boost the immune system, improve brain function, reduce inflammation, enhance energy, eliminate toxins, cut cravings and more! NanOmega – Organic Flax, Vegan DHA & Synergistic Vitamins (B6, Folic Acid, B12, E & D3) –promotes mental focus and healthy mood, maintains normal cholesterol and triglyceride levels, maintains healthy skin, visual acuity, gastrointestinal health, bone and joint health, prostate and breast health along with additional antioxidant protection. NanoPro – Whey Protein with Colostrum Peptides – provides the highest biological value of all proteins and it is carefully processed to produce unique bio-active peptides. These whey peptides support optimal detoxification and antioxidant status, a balanced immune system, healthy gastrointestinal function, tissue repair and regeneration, builds muscle and bone mass, balances stress hormones and sleep chemicals and balances blood sugar maintenance. Come in to Evolutions to learn more about these SuperFood supplements! Individual samples available for $2 each or three for $5. All of these are available today at Evolutions in one-month supplies.